Ever hear of the 10,000 rule? The idea that it takes 10,000 hours to become world-class at anything? Well, what if it wasn’t true? And, what if the research it was based on actually said something very different? Something that somehow got “lost in translation” when the data went mainstream. In today’s conversation, we sit down with K. Anders Ericsson, PhD, Professor of Psychology at Florida State University. He studies what it takes to be the best in the world in domains such as music, chess, medicine, and sports. And it was his research that served the basis for the now wildly popular 10,000-hour rule that’s been cited in some of the biggest books of the last 10 years.. Problem is, as you’re about to discover, it’s a lie. There never was a 10,000 rule. That number, along with the idea of a “rule,” is based on a series of misinterpretations of his work. 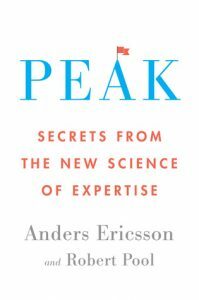 In this new book, Peak: Secrets from the New Science of Expertise, and in today’s conversation, Ericsson finally sets the record straight. He distills three decades of myth-shattering research into a powerful learning strategy that is fundamentally different from the way people traditionally think about acquiring new abilities. The difference between “traditional” practice, “purposeful” practice and “deliberate” practice. How Malcolm Gladwell may have misinterpreted Ericsson’s research on the 10,000-hour rule. How Ericsson sees the importance of the role of a teacher in accelerating the path to expertise. What actually motivates someone to do the often grueling work for the years it takes to become great. How he’s studied people who have learned and developed systems to memorize long strings of numbers. Be sure to subscribe to our weekly Good Life Updates and listen on iTunes to make sure you never miss an episode!